Our first few posts here on Paleoaerie have discussed what we are about, why and what we are planning. Over on Facebook, we’ve discussed a lot of things that may be of interest to readers. We have discussed how to reach kids, why teaching how science works matters to everyone and certain TV shows and books that don’t think so or do it badly, as well as some that do it well. We noted interesting goings-on at the Museum of Discovery. We found informative videos and free online courses on dinosaurs, evolution, the genetics of evolution, and human evolution. We found fossil databases, museum collections, and maps of the earth through time. We examined software available to teach science methods and concepts, use 3D modeling in class, upcoming TV shows, Next Generation Science Standards apps, as well as discussing the use of iPads in class. We found a request for scientists willing to work with classes. We even found card games of interest and the Whirlpool of Life. We’ve discussed the role of evolution in pathogen virulence in disease, antibiotics and cancer, and how it can help manage fisheries . We’ve covered the evolution of weird sharks, giant viruses, early mammals, and the earliest eukaryote. We learned about tyrannosaurs and why they weren’t scavengers, how dinosaurs grew feathers, lost their tails evolving into birds, what is and is not a dinosaur, and using dinosaurs to teach anatomy. We learned about exhibiting extinctions and what they mean to ecosystem health, surviving them, as well as de-extinctions. We learned when teeth evolved, the use of half a sucker, how carnivores become herbivores, and the evolution (or not) of intelligence. We learned about the role of chance in evolution and the haphazard way evolution builds things. We met Mouseunculus and found out just how big a billion really is. We saw science art, art and science, and art in technology. We talked about Darwin and Wallace, asking scientists about their research, and the process of science correcting itself. And that’s not all. We’ve said a lot, but a communication is not a one-way street. I’ve referred to Paleoaerie as “we” many times. Thus far, it’s mostly been “I” that has done the communicating. But let’s change that dynamic. Every couple of weeks or so, we will have Forum Friday. What’s a forum, you ask? 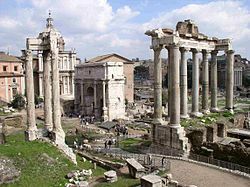 Forums were originally a “marketplace or public square of an ancient Roman city” (Merriam-Webster). But more importantly, they were places people gathered to discuss things of interest to them, or simply just to converse and connect with others. Paleoaerie is more than what I bring to it. To really work, others need to contribute. Forum Fridays is a designated space for you to tell me what you want to see, what you want discussed, provide feedback and discussion on topics presented during the week. So let’s talk. I have one simple question: What do you want? (I promise, my name is not Morden, it will turn out better that it did for Ambassador Mollari). By paleoaerie in Forum Friday on August 16, 2013 . I am most interested in how things apply to today. How evolution effects us now (antibiotics, for example) and how we effect others because they can’t keep up (global warming). I’m also interested in how to approach folk who don’t understand scientific concepts to help them understand the science that pops up (usually terribly misconstrued) in the media (again, global warming, or vaccines). Although, I also very much enjoy all that you’ve been posting. I like that when new things are discovered, scientists allow their concepts to grow or shift as needed when what was previously understood is shown to be incorrect or incomplete. Thank you for your input. We will definitely be continuing to post topics on applied evolution as it is a topic that directly affects people where they live in a practical, hard-edged manner. You may like the latest post on the Facebook page concerning the use of directed evolution to create bacteria capable of cleaning up toxic waste. thus far, this sort of post has been made on our Facebook page. I had not previously considered doing much with that on the website itself, but it would indeed be a worthy topic to address more fully here. That sort of thing can be found competently done elsewhere, better than I could do, but I could do some lengthier posts providing more detail on particular facets of stories linked to on the Facebook page. We will see about adding that to the lineup. Talking with people who lack scientific backgrounds and/or are approaching the topic from a preconceived worldview is a tough problem, one that we plan on addressing and will return to from time to time as new ideas and suggestions come to light.